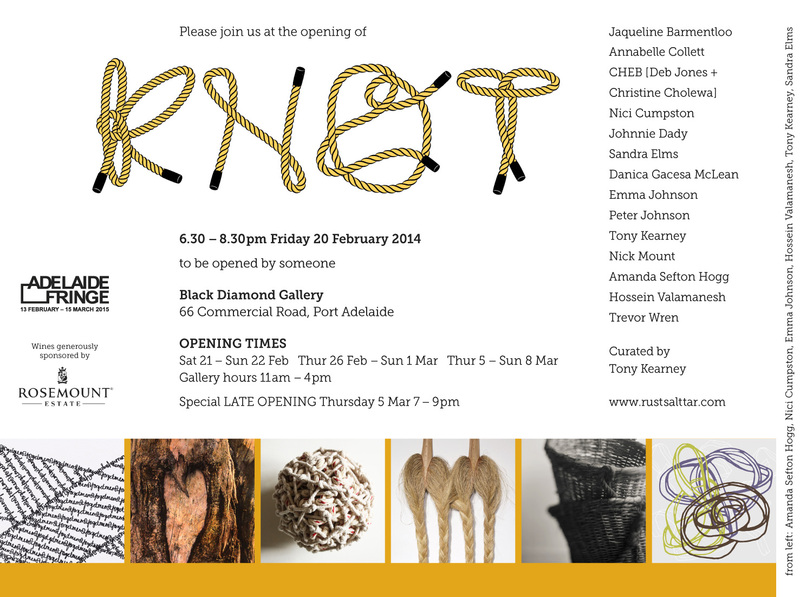 I am delighted to be involved in Tony Kearney’s “KNOT” exhibition in Port Adelaide, part of this year’s Adelaide Fringe Festival. If you are in Adelaide, pop in and have a look! “Before there was superglue and PVA, before nuts and bolts, it was knots that held the world together. Bowline, Hangman’s Noose, Monkey Fist, Half Hitch, Rolling Hitch, Clove Hitch, Trucker’s Hitch, Sheepshank, Sheet Bend, Slip, Knit, Purl and Figure-Eight. All secure to the Bitter End. We have knots for knickers and knackers, in all things woven and stitched, in baskets, rugs, clothes, when getting hitched, lacing shoes, tying a tie, knots to make string into nets, knots in wood, in the stomach, in muscles, in love. Knots of speed to tell how fast your boat’s going or the wind’s blowing.